Managing finances can be taxing in more ways than one for 'small and midsized businesses' (SMBs), which is why Intuit has updated its cloud-based QuickBooks accountancy software to help them complete financial tasks in fewer steps. 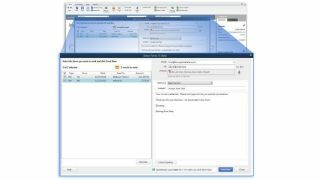 QuickBooks 2014 now provides an Attached Documents feature that stores relevant documents inside the software to help with file management and record keeping. Documents can now be scanned, dragged and dropped into it and you can associate them with specific transaction types. It has also added the ability to track income in real time as an alternative to compiling reports, which can be accessed faster in a single click from the Reports Ribbon. Intuit claims that this lets you immediately act on transactions to speed up payments. Additionally, small business owners can now save further time by copying and pasting entire lines within transactions, removing the need to add each item into them. Other new features include the introduction of printing entire reports on one page to save paper and customised email templates that can be automatically populated. Additionally, QuickBooks 2014 has made it easier to track emails sent to customers, suppliers or employees without leaving the programme, Intuit claims. Sarah Gibson, Project Manager for QuickBooks 2014, told TRPro that Intuit introduced "simpler processes, easier collaboration with accountants and time-saving features" to help SMBs spend more time building and growing their companies following user feedback. You can subscribe to QuickBooks 2014 on Intuit's website from today through the company's website.